Are you familiar with the country of Malta? I am not, at least not until recently. This country to the south of the European continent may be minuscule compared to most of its bigger sisters, but it held honors which cast no doubt on its significance in history. It is the first and one of only two collective holder of the George Cross Award, the famous residence site of Knights Hospitaller, otherwise known as Knights of Malta, and the summit host for the meeting which signified the end of Cold War. And what treasure does such a small island holds within its boundary? In order to introduce its history to the world, such treasures are immortalized in Malta Post’s ‘Treasures of Malta’ series. The historic gates held the honor of being last year’s title for this series, but I was not particularly interested in its arts. This year’s title, Fountains, is another matter. Sculptured architectures always hold a certain fascination for me. Maybe it is the time and effort required to shape the material into a work of art, not to mention the skill required behind, but whatever the reason, I am always drawn to such work in a city which I visited. Triton Fountain of Floriana, Malta (image taken from Wikipedia). The 3 fountains chosen to be immortalized in this title are the Vilhena Fountain, the Triton Fountain and the Spinola Fountain, all of which are located in Floriana. The Vilhena Fountain was significant for the reason that it was named after Portugese Grand Master António Manoel de Vilhena, the architect which transformed the city of Floriana into a residential area. The famous lion on the fountain guarded the city since 1728. It may not be as old, but the Triton Fountain is as famous as the former, standing proud in the center of the City Gate Square. 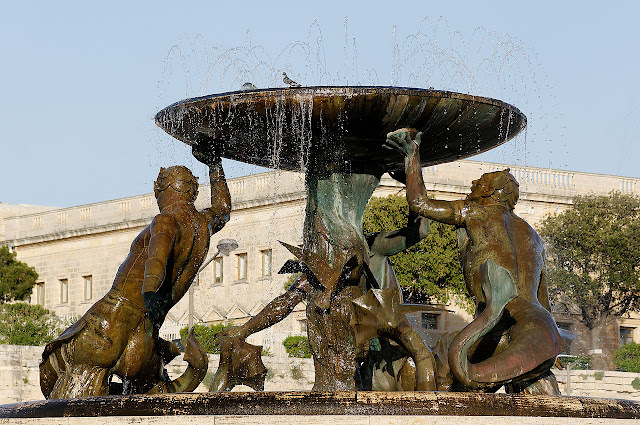 Recent controversies surrounding the movement of this fountain raised ire amongst the citizens of Malta, giving it more limelight despite its relatively infant status in Maltese history. Least known (at least from the internet), but no less remarkable, is the Spinola Fountain, built towards the end of the nineteenth century. Located in the Palazzo Spinola, hence the fountain’s name, it was part of the palace once owned by one Fra Paolo Raffaela Spinola, bailiff of Lombardy in 1660. And with these nice new stamp issues, Malta Post really piqued my interest in following their stamp issues with the hope that their next release will be as nice, if not better than, this current art.